The bard isn’t anybody’s favorite character class. Warriors get to stab stuff! Wizards can play with magic! Rogues get to be, well, rogue-ish! Bards…sing. Not that there’s anything wrong with singing, but it isn’t terribly helpful when you’re off on a world-saving adventure. In most RPGs, the bard’s job is to support the real heroes, and really, where’s the fun in that? Wandersong begins with a test of heroism, which the game’s perpetually-upbeat Bard protagonist promptly fumbles. Turns out he’s not the sword-wielding, man-of-action type, which is a problem because the world is ending and could really use a hero. Thankfully, Eyala, the rainbow-haired messenger of the Goddess Eya, takes a liking to The Bard and informs him that maybe, just maybe, the destruction of the world could be averted by singing the Earthsong, which has been split into seven parts and distributed amongst powerful deities known as the Guardian Spirits. And so, you set off to various themed world to collect these audio MacGuffins. Along the way you meet Miriam, an acerbic young witch who’s been making her own preparations for the end of the world with her sassy grandma. Miriam somewhat reluctantly agrees to join you in your quest, which is good, because flying brooms beat the hell out of walking. So far, so normal. Initially, Wandersong’s story seems to be fairly typical Zelda-style action-adventure fare, but soon enough you discover Eyala is playing both sides of this apocalypse. She’s also backing a more traditional Hero, who’s been tasked with killing the Guardian Spirits and hastening the death and rebirth of the world. This is the first of several revelations that throw The Bard’s cheery quest into disarray. 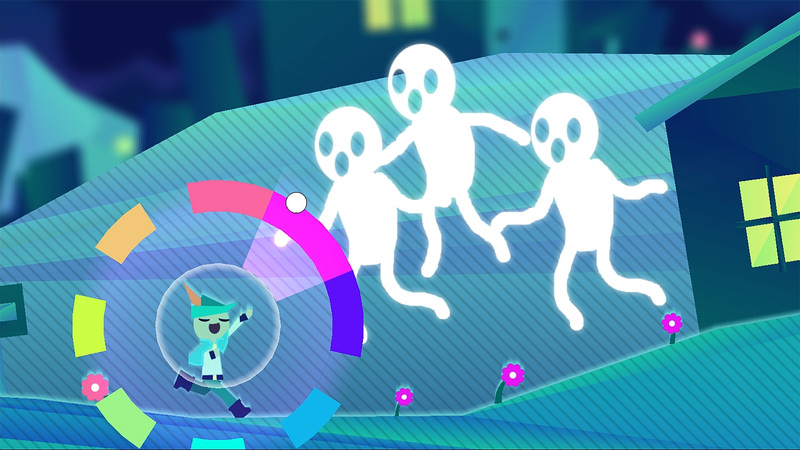 As mentioned, everything in Wandersong is achieved through singing and an occasional bit of jumping. The Bard is a dedicated pacifist, and aside from a brief section where you play as The Hero, there are no weapons to wield nor any real combat to be had. Singing is done via a weapon wheel of sorts, but instead of guns and tools, you’re selecting notes. Simply point the right analog stick in different directions to belt out an impromptu tune. 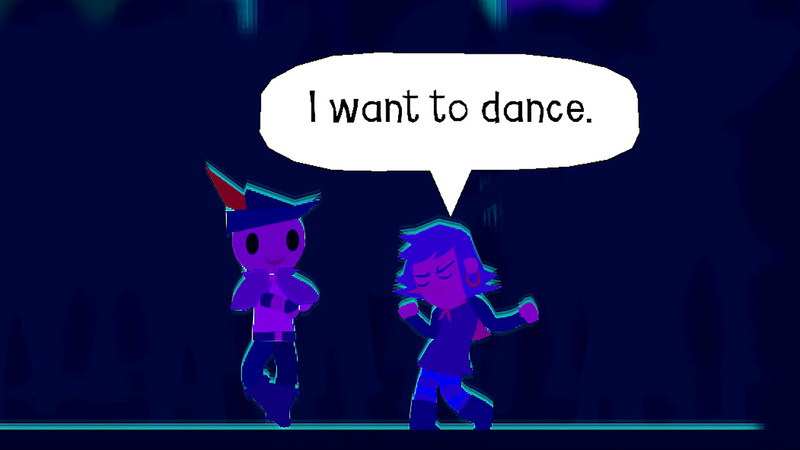 At its most basic, Wandersong is a straightforward game of Simon Says. Characters or enemies will rattle off a few notes and you just have to copy them. Other times, you’ll have to sing along to more complex tunes, or engage in rhythm games that tweak the game’s usual rules and controls a bit. Don’t worry if you’re crap at most music games – this isn’t Guitar Hero or PaRappa the Rapper. Wandersong does require some timing, but it’s generally very forgiving. The accessibility of Wandersong’s controls is admirable, although I did sometimes wish the game engaged more deeply with its musical side. The game never requires you to know anything about music, nor are you rewarded for coming up with your own compositions. During Wandersong’s platforming segments, the song wheel comes into play in very direct, simplistic ways – you’ll use it to do things like direct gusts of wind, cause plants to grow in certain directions, and other stuff that has little to do with music. It would’ve been interesting if the notes you’re required to play during platforming sections contributed to the soundtrack, creating a unique rhythm/tune, but it’s not really the case. Make no mistake, there are some lovely ditties in Wandersong, they’re just not as interactive as I would’ve liked. Wandersong varies widely in terms of tone and level design, with players embarking on a pirate adventure, plotting corporate espionage in a living town with a full day-night cycle, and engaging in some Metroidvania-style exploration on an act-to-act basis. The game’s obvious Earthbound inspiration really shows through here, as much like that classic, you never really know what might be around the next bend. 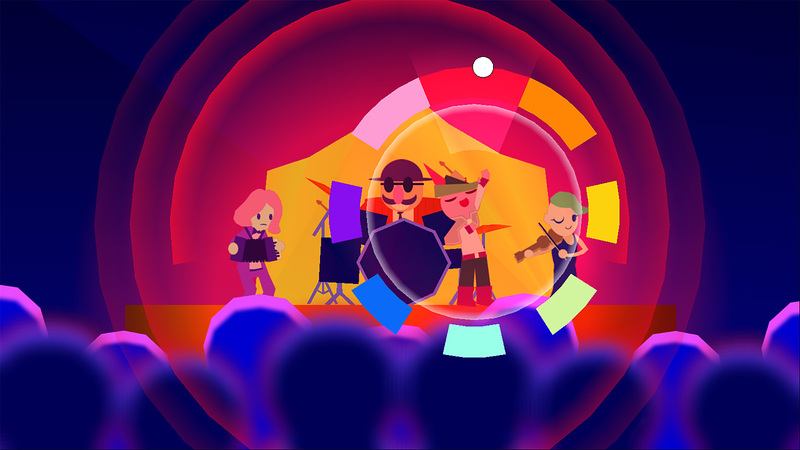 This variety is one of Wandersong’s strengths, but it can also be a weakness, as the game suffers from a minor case of “Jack of all trades, master of none” syndrome. The game’s action-platforming bits suffer from this the most – a finicky section where you have to sing to randomly-transforming blobby platforms, and an overlong late-game stealth section are particularly rough. If Wandersong were just another indie platformer with a clever gimmick, it would be worth considering, perhaps on sale, but not much more. What really sets the game apart as something special is its writing. Much like recent animated hits like Adventure Time or Over the Garden Wall, Wandersong sets out as a light cartoony romp, with a slight ironic edge, but eventually moves into “surprisingly real” territory. Characters like Miriam and The Hero, who feel like stock archetypes at first, reveal hidden depths. Even the relentlessly-chipper Bard has more going on than you might expect. This is a game with something interesting to say about happiness, and how it’s affected by the ways we identify ourselves and mythologize our own lives. 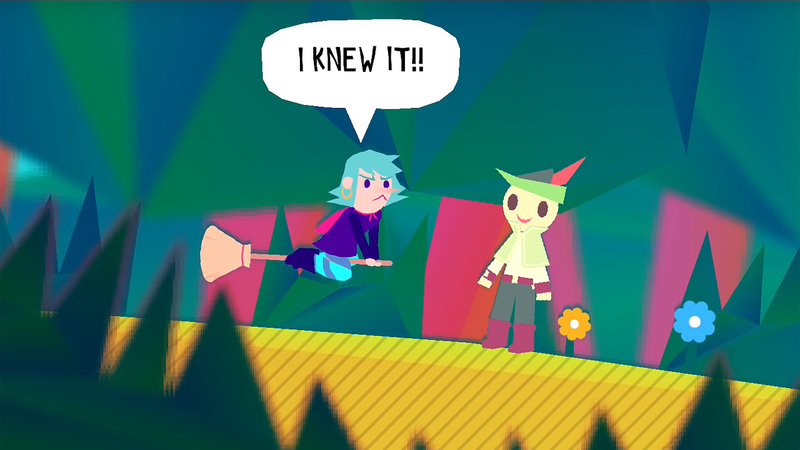 It also really nails its ending – Wandersong’s final act is among the most emotionally satisfying I’ve ever played. Charming visuals further bolster Wandersong’s story. While the game’s paper-cutout style may initially appear simple, even a bit crude, characters are actually quite well-animated, conveying a surprising range of moods and emotions. The game isn’t as sharp as it could be, particularly on the Switch, but a bit of visual schmutz here and there doesn’t detract from the experience too seriously. Wandersong delivers a fairly meaty a fairly meaty campaign for an indie adventure of this type, weighing in at 10 to 12 hours. The game doesn’t have a huge amount of traditional replay value, but it sticks in your head like a good song. Sometimes “this game made me feel good” is reason enough to replay. This review was based on a Nintendo Switch copy of Wandersong provided by publisher Humble Bundle. 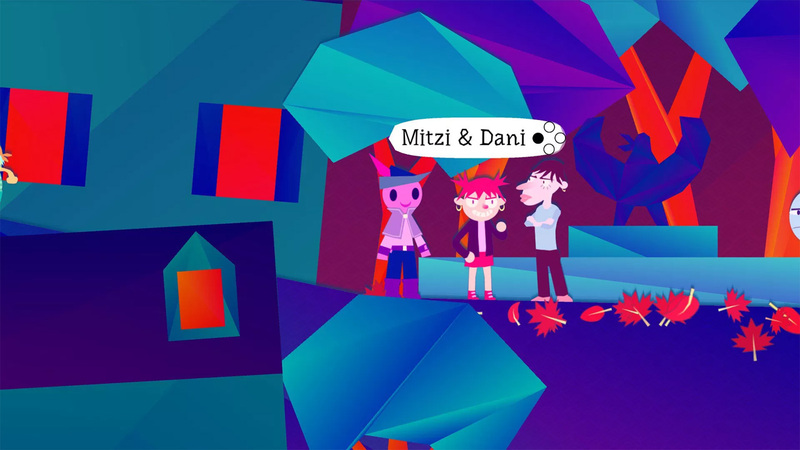 Wandersong is an accessible, uplifting adventure that deftly builds to a memorable crescendo. Sure, the game has a few rough edges, most of which can be attributed its humble indie origins, but it more than makes up for its shortcomings with its heartfelt characters and story. Put on your adventuring hat and cape and warm up your pipes, it’s time for an emotional world rescue.